Tonight as we visited hospitality suites at the Republican Advance I met fellow ODBA blogger Greg Letique from Black Velvet Bruce Li. The group consisted of another ODBA blogger Shaun Kenney. There was a rumor Ben Tribbett was somewhere on the premises but we never saw him ... however, I kept running into GOP Hokie of Elephant Ears. The suites were crowded as well wishers stopped by to speak to Bob McDonnell (his wife, Maureen, was once a Redskins cheerleader so veteran and current cheerleaders made it a popular stop for the evening). Former Attorney General Jerry Kilgore was spotted there. Bill Bolling's suite was crowded with many familiar faces. Randy Marcus was spotted as he talked with someone in the middle of the crowd, and it was difficult to squeeze in the room. Chris Saxman's suite was packed, notabaly, with young people. Lapel stickers saying, "Chris Saxman ... A New Day In Virginia" were being worn by many. Del. Saxman's 2001 campaign manager Dave Rexrode was there ... could he be pulled back into action for his former boss? Del. Saxman's wife, Michele, and his four children were there, too. Governor Jim Gilmore will have a hospitality suite Saturday night. He was spotted tonight as the reception was going on. All presidential campaigns are set up with information, bumper stickers, petitions .... GOP merchandise is for sale ... everyone is mixing and mingling. The opening reception was hosted by Attorney Gen. Bob McDonnell from 6-8:00 this evening with all in attendance as well as Senator John Warner and RPV Chairman John Hager. ... people who are just being rude and obnoxious who generally try to offend, shock, harass, and/or abuse who otherwise annoy people. Dealing with trolls can often be difficult, but they should not go unwarned, un-removed or unbanned. Trolls can destroy a community, and often this is their goal. One of the more prominent trolls who has stalked the SWAC blogs is exposed by RightsideVA. Submit a letter to the editor at the Staunton News Leader ... and you are expected to sign your name and provide contact information -- address and phone number -- so the editorial staff can check the legitimacy of the letter. The NL publishes your letter ... and then you are subjected to their online trolls. Anyone can post a comment criticizing or praising the letter ... but, unfortunately, more often than not the commenters are criticizing the letter writer. Inaccurate information, foul language, and just plain garbage is allowed to pass through unchecked for anyone to read. Possible slander? Innuendo? Character assassination? It all happens at the News Leader's online opinion section. Their credibility in the community has slipped to abysmal depths. As a result most conservative commenters have stopped posting to the NL because they were verbally ripped to shreds by anonymous trolls who, in typical cowardly fashion, hid behind their anonymous facades to write something they probably would not say if identified. Here is a suggestion to the NL: start holding your online commenters accountable just as you do the letter writers. Require a name, address, and phone number ... and then contact them to verify their message before allowing the post to appear. Time consuming? Yes. But the return would be a more balanced comment page and, perhaps, the possibility of more folks being willing to pen a letter to the editor. As of now it's open season on anyone who dares to write and take a chance on running the troll gauntlet of anonymous commenters waiting for the next victim. A massive fire destroyed the western Albemarle County home of Dave Matthews Band bass player Stefan Lessard on Thursday morning. The blaze started at 7:30 a.m. at Lessard's house on Morgantown Road. Lessard, 33, and his son were in the house at the time of the fire and escaped unharmed. No one was injured but the house and its contents are considered a total loss. My Gramps died at Pearl on a day in December." 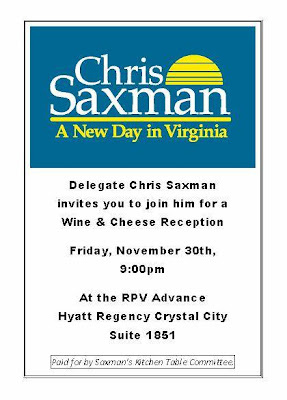 Delegate Chris Saxman will announce his decision this weekend at the Republican Advance about whether to run for the U.S. Senate nomination. Former governor Jim Gilmore is the only declared candidate at this time. If Del. Saxman got into the race he would challenge Governor Gilmore at the Republican Convention scheduled for the end of May 2008. "I will announce this weekend," said Saxman, 42. "The time is too compressed. We can't leave these things out there until the end of the year. It's time to move on with a decision." Del. Saxman has a hospitality suite Friday night, and will address the group of activists Saturday afternoon following Governor Gilmore. It is looking to be an exciting weekend. Thanks, BNN, for the # 1 ranking this week ... don't know what I did to deserve it but am grateful. Kerr submitted the question for Republican candidates at the video debate "a couple months ago," and said last Saturday CNN called him and said they'd like him to come to the debate. He said the cable news network paid for his flight, his hotel and his transportation to and from the event. Is it normal for networks to pay for people to attend debates to ask a question? Read the rest of the article here. The reason for Christmas -- no one could say. December 25th is just a "holiday." At Lowe's the word "Christmas" was nowhere to be found. You won't hear the word "Christmas" -- it won't touch your ears. So as you celebrate "winter break" under your "dream tree,"
Shout MERRY CHRISTMAS ... not Happy Holiday! Join Move America Forward for the “Honoring Heroes at the Holidays Tour” now through December 16th as they cross this nation holding pro-troop events in 40 cities across America to honor and salute the men and women of the U.S. military who will be thousands of miles away from their homes and families during this holiday season. Along the tour they will be collecting more than 100,000 Christmas, Hanukkah and holiday greeting cards for our troops that will be delivered to them in Iraq and Afghanistan. Get your kids involved, and invite local schools to participate! Hear what legendary TV personality, Ed McMahon, has to say about the effort - CLICK HERE to LISTEN. Bring the cards to one of the 40 pro-troop holiday events along the route of the "Honoring Our Heroes at the Holidays Tour" - you can find the tour route and itinerary here: View the Tentative Route/Itinerary - HERE. And watch the television news coverage from the kickoff event in Sacramento, CA to get a feel for what this effort is all about - WATCH IT HERE. It's a card ... it's for our heroes. There is no denying it anymore—even the mainstream media is reporting the incredible progress in Iraq, and giving credit where credit is due: General Petraeus's new counter-insurgency plan and the local political progress it has enabled. On November 18, the Washington Post editorialized that "By every metric used to measure the war…there has been an enormous improvement since January." In this week's edition of Newsweek reporter Rod Nordland writes upon his return to Iraq that, "I can actually say that things do seem to have gotten better, and in ways that may even be durable… There hasn't been a successful suicide car bombing in Baghdad in five weeks… Al Qaeda in Iraq is starting to look like a spent force, especially in Baghdad." And the New York Times actually reported that, "Casualties suffered by Iraqi security forces…were down 40 percent since the beginning of the troop reinforcement plan. Civilian fatalities in Baghdad…were down 75 percent in recent months. In some areas, the attacks have not been so low since the spring and summer of 2005." To Vets for Freedom members, these facts come as no surprise. But, apparently, the leadership in Congress still doesn't get it. Despite overwhelming progress in Iraq, Speaker Nancy Pelosi and Majority Leader Harry Reid continue to play politics with the troops…and their wartime funding. General Petraeus's new strategy is working and our troops are routing Al Qaeda and making incredible progress in Iraq. Our troops, along with our Iraqi allies, are certainly doing their part—so why won't Congress act? WILL YOU WRITE A LETTER TO THE EDITOR? This week, we urgently need all Vets for Freedom members to write a short Letter to the Editor in their local newspaper, talking about the progress in Iraq and encouraging their member of Congress to fund the troops—without timelines or deadlines for defeat. 1. Go to the Vets for Freedom homepage and click on the "Contact the Media" button on the right. It's the button with the rotating newspapers. 2. Enter your Zip Code and click on the local newspaper (or newspapers) of your choice. 3. Compose a letter (200 words or less) and send it to your paper through our site. 1. As a direct result of the new counter-insurgency strategy implemented by General David Petraeus, real and sustainable progress is being made in Iraq. 2. General Petraeus, and all 160,000 troops in Iraq, deserve immediate funding-without timelines—in order to continue defeating Al Qaeda and Iranian-backed militias. 3. Without money from Congress, our troops will not have the ability to complete the mission and leave behind a stable Iraq, especially in a timely manner. For even more material, visit the Vets for Freedom website to see our "Progress in Iraq" section and get the latest facts about both military and political progress in Iraq. We are winning the war in Iraq – and the American people need to hear about it. Do your part to ensure that they read about it in the paper this week. It's the least you can do, and it does make a difference. Raising Kaine considers a Republican oath an "idiotic" idea. Perhaps they do not remember that the Augusta County Democrats required a loyalty oath at their mass meeting last year. Is that idiotic, too? Bundle up the kids, pile them in the car, and head to Staunton's Gypsy Hill Park to drive around the two-mile loop and gaze, ooh, and ahh over the 30-plus Christmas displays set up by area organizations. Last year, 30,000 vehicles viewed the holiday treat. Open daily now through January 5, the lights will be on from 5-11 p.m. offering a delightful treat for young and old. Better still, park the car and walk around the duck pond in the cold night air and give the kids a chance to stretch their legs. It is also fun to leave the vehicles in Gypsy Hill Park, catch the trolly (there's a stop in the park near the Thornrose Avenue entrance), and ride around downtown Staunton to see the storefronts, lights, and decorations. Hop off at Shenandoah Pizza or the Bistro for hot chocolate. The trolly is free and there are numerous stops all around town. Or just settle back in your seat and listen to the piped-in holiday music as you ride. Christmas in historic Staunton ... that small-town feeling makes it seem like Christmas. When Not Larry Sabato says soon-to-be-ex-Senator Brandon Bell has an "excellent new blog," my red flags go up. Can someone quote for me the last time liberal democrat bloggers bashed one of their own candidates? Thanks for the unity, Brandon. Congratulations to conservative Senator Mark Obenshain (R-Harrisonburg) who was voted into leadership of the state senate. He will share whip duties with Senator Frank Wagner (R-Virginia Beach). For the second year, Monticello will mark the holiday season with special themed versions of its popular evening Signature Tours. Tickets are available for Tuesday, Dec. 4; Thursday, Dec. 6; Tuesday, Dec. 11; Tuesday, Dec. 18; and Thursday, Dec. 20. There will be two tours each evening, beginning at 5:30 and 5:45 p.m. Each tour will be limited to a maximum of 20 people. Tickets are still available for the Monticello Holiday Wreath Workshops scheduled for 9:30 a.m. on Friday, Dec. 7, and 1 p.m. on Sunday, Dec. 9. Participants in these three-hour workshops, now in their 21st year, are guided through the process of making a traditional holiday wreath. All materials - greenery, wreath forms, pins, wire, etc. - are provided, but participants are advised to bring hand pruners. Holiday Shopping with Monticello....Looking for something special for the history lover in your life? Check out this unique collection of gifts, toys, and holiday decorations. Special house tours offering an in-depth look at Thomas Jefferson’s “essay in architecture” will be introduced in 2008. These Architecture Tours of Monticello will be conducted three times daily in January and February. Each guided tour, which will last approximately 75 minutes, will give visitors the opportunity to view, hear about, and consider the various structural and decorative elements that have earned Monticello widespread recognition as one of the icons of American architecture. The tour route will include rooms on the main floor of the house and the third-floor Dome Room. The tours will begin at 11 a.m., 1 p.m., and 3 p.m. each day from Jan. 2 through Feb. 29. Each tour will be limited to a maximum of 18 people. Tickets for Architecture Tours are $25 per person; no discounts apply. Reserved tickets can be purchased in advance beginning Dec. 1 through the Web site monticello.org or by calling (434) 984-9822. A credit card is required. Rioting, looting, and vandalizing occurred in Paris overnight ... Fox News coverage here. Christmas in the Shenandoah Valley: Virginia National Guard Band presents Christmas "military style"
Memorial Baptist Church will be hosting the Virginia Army National Guard band along with a vocal choir from Fishburne Military Academy as they present a collection of Christmas and holiday music selections. The Adjutant General of the Virginia Guard and Air Force will be in attendance. Augusta County supervisors are mulling the possibility of dropping car decals but would retain the $25 annual fee which generates almost $2 million in revenue. The issue will be taken up by the new Board in late January. Sour grapes ... poor losers ... will they never get over it? Most of us were taught as children to be graceful losers. It is scary when adults act like kindergartners where politics are concerned. Should-have-been President Al Gore was at the White House Monday with the wretched George W. Bush, as the White House' current occupant hosted Nobel Prize winners. That is pathetic. Seven years later ... and this man cannot get over it. Read my lips: George W. Bush won the 2000 election and, even though the dems pulled shenanigans and held off the announcement a day (thus depriving the President's supporters of celebrating election night), he won again in 2004. There's a new kid on the SWAC block! SixtyFour81.com is the informational center for SWAC and Central Shenandoah Valley happenings, news, and information from Augusta Republican Committee Chairman Dr. Kurt Michael. SixtyFour81.com ... the Republican crossroads of western Virginia. Through their church, my cousins hosted a gentleman from Africa at their home for six months last year. He came to America for medical treatment, something that was to take a couple of months, but complications extended his stay to six months before he was able to return to his country. He called my cousins Thursday to wish them Happy Thanksgiving. He was with them last Thanksgiving ... he remembered the bountiful feast ... and he called to thank them for all they had done for him and to let them know he had taken this American tradition back to his homeland in Africa. He comes from what is considered the more well-off in Africa and, yet, he lives in conditions more primitive than the "poor" people in the United States. A shower was a wonder to him because he had never been able to bathe in warm water before ... and the water came readily through the tap. Water in his town is a precious and limited commodity. Food was another wonder to him because it was so plentiful. When he ate, he ate everything on his plate ... fish bones, shrimp tails, garnishes ... he explained that nothing went to waste where food was scarce. Walking through Stony Point Shopping Center in Richmond, he stopped in front of the outdoor fountain and marveled at the free-flowing water ... and then looked skyward, held out his arms, and said, "America! Where water is so plentiful it can be wasted!" Mark your calendars for Monday, December 3, 2007 -- Staunton's annual Christmas parade will begin at 7:00 p.m. The theme of this year's parade is "Holiday Sparkle" ... and sparkle it will in historic downtown Staunton as Christmas lights twinkle in storefronts as the parade passes by on Beverley Street. This is always a popular parade with the streets crowded four-deep as people, young and old alike, line up to watch the float entries of local churches, businesses, and civic groups, and to hear from local high school bands and to wave to friends in the parade. Fun for all! On the western edge of Augusta County at the Highland County line rises Shenandoah Mountain. Many travel Rt. 250 which climbs the mountain, crests at an overlook and historical Confederate Breastworks, then drops down into Highland on the western side. Shortly before noon on Friday it claimed the life of 30-year-old Jarret Kyger whose tractor-trailer flipped over on the curvy road, closing it in both directions until the wreckage could be cleared. The cab was crushed, killing Mr. Kyger at the scene, but his two-year-old nephew, who was strapped in a child restraint seat, survived the wreck with only minor injuries. The sharp curves of the road combined with speed may have played a role in the accident ... but the question is unknown as to whether he was driving too fast for mountaineous conditions or if his brakes failed or if some other unknown factor may have contributed to the accident. A driver for J.E. Bazzle and Sons out of Broadway and owner/operator of J&L Transport for hauling of hay and cattle, Mr. Kyger was known as a hard worker as well as a friend to the Bazzle family. He lived in Mathias, West Virginia, but worked in Broadway so he would have traveled the mountain roads daily. Mr. Kyger is survived by his wife and parents. A Tuesday funeral is planned. His obituary can be found in the Harrisonburg Daily News Record. in the history of the world." 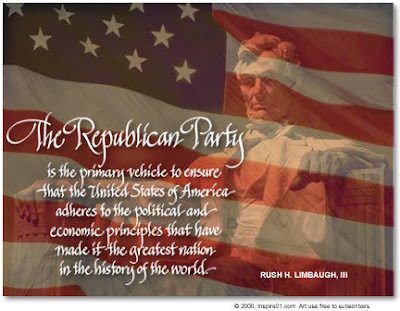 GOP Advance next weekend ... calling all Republican bloggers! I am looking forward to next weekend's Republican Advance in Northern Virginia. At last year's Advance at the Homestead, Attorney General Bob McDonnell addressed a small group of perhaps 12 to 15 conservative bloggers including Shaun Kenney at an impromptu gathering. This year Shaun, as Communications Director of the Republican Party of Virginia, has planned some blogging discussions/panels that will be fun as we meet others from around the state who blog for the conservative cause. If you plan to attend I would love to know so I can look you up. Conservative bloggers .... see you at the Advance! After their 32-21 win Saturday over the University of Virginia, Virginia Tech will face a rival that beat them earlier this season. The Hokies won the Commonwealth Cup, but the bigger prize is the Atlantic Coast Conference Coastal Division title. 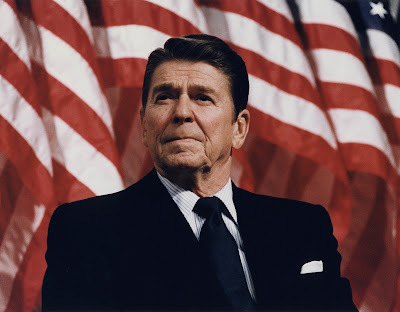 Virginia Tech (7-1 ACC, 10-2) will play Boston College for the ACC title on Saturday in Jacksonville, Fla., at 1 p.m.
Ronald Reagan knew, as families celebrate Thanksgiving, that the source of American prosperity comes from God, not bureaucrats and public officials in Washington. Update: Virginia Tech won! Final score: 33-21. Celebration time! The Faberge collection is one of my favorites at the Virginia Museum of Fine Arts. It has been a part of the permanent exhibit since it was bequeathed to the museum by Lillian Thomas Pratt upon her death in 1947 (with additional pieces donated by others throughout the years). The history of Russia's Romanov family intrigued me when I was young, and the tragedy of revolution and massacre of the entire royal family caused me to research and read historical accounts about the events and the people. Part of the history of the Romanovs was the Faberge eggs they had specially made for one another as gifts. Located in St. Petersburg and Moscow, the Faberge company was known worldwide from the early 1880s until 1917 when they closed after Russia's October Revolution. They were commissioned by the royal family to craft Easter eggs, each with a different scene or surprise inside. Their craftsmanship, beauty, and detail are to be enjoyed as they take us back to a long ago time in a far away land. Five of those eggs are at the Virginia Museum along with many other Faberge creations. It is free to the public and can be seen on the same visit to view the Eugene Boudin collection that is on loan until January 27, 2008. If you are looking for that special chocolate something for Christmas, you have got to check out For the Love of Chocolate in Carytown's Cary Court in Richmond. The aroma just walking in the door is enough to make you pick up a shopping basket and start looking. For the Love of Chocolate is stocked to the rafters with every shape, form, style, and flavor of chocolate that you can possibly imagine from chocolatiers around the world. You can find everything from Neuhaus Belgian Chocolate ($15-$50), Lake Champlain milk and dark chocolate ($5-$30), and Joseph Schmidt's assorted chocolate and truffles ($5-$25) to a full line of the more accessible Lindt white, milk, and dark chocolates ($5-$35) and Giradelli chocolates ($1.50-$50). There are so many adorable Christmas designs that I cannot even begin to describe them. Suffice it to say they would brighten up anyone's stocking. While there you may want to stroll through the galleries to see some of the other exhibits including the famous Faberge collection. The cafe area is a nice place to sit and talk over a cup of coffee ($1.50) or a glass of iced tea ($1.50) ... and there is a gift shop for those who need something to take home. The exhibit is free and open to the public Wednesday through Sunday from 11 am until 5 pm. The Virginia Museum of Fine Arts is located at 200 N. Boulevard. Construction at the museum has closed off the main parking lot (but handicap parking is still available there) so you will need to either park in the VMFA parking deck at Shepherd Street and Stuart Avenue ($3) or find on-street parking. As written here on November 11, Radcliffe Vernon went deer hunting alone on November 10 and was the first accidental fatality of the muzzleloader season. Vernon, 36, left his home in Hot Springs wearing no blaze orange clothing and made the short trip to Lake Moomaw to hunt alone in the state's T.M. Gathright Wildlife Management Area. The bullet that struck Vernon hit his arm and severed his brachial artery before entering and exiting his chest. The shooter heard Vernon cry out and went to find help, but the blood loss was massive and the help arrived too late in that remote area. Check out John Maxfield's post. ... but the two most popular were "family" and "freedom." It is 5 a.m. and the bird is stuffed and in the oven as I prepare for this Thanksgiving Day with family. My two sisters and I spent much of yesterday in the kitchen making stuffing, pies, preparing vegetables dishes to cook today ... so we are well on our way to being ready for our mid-day meal. It's quiet now but as others awaken one by one the house will become a beehive of activity. The 12-year-old nieces will be playing a board game or doing something else together, SWAC Daughter will be helping in the kitchen, the Macy's Thanksgiving Day parade will be on the kitchen TV as well as the family room where the guys will gather around to watch and talk. My parents will be in and out of the kitchen but will be able to relax since we girls are doing all the cooking, and our spouses and children always help with cleaning up. Americans are a grateful people, ever mindful of the many ways we have been blessed. On Thanksgiving Day, we lift our hearts in gratitude for the freedoms we enjoy, the people we love, and the gifts of our prosperous land. Our country was founded by men and women who realized their dependence on God and were humbled by His providence and grace. The early explorers and settlers who arrived in this land gave thanks for God's protection and for the extraordinary natural abundance they found. Since the first National Day of Thanksgiving was proclaimed by President George Washington, Americans have come togther to offer thanks for our many blessings. We recall the great privilege it is to live in a land where freedom is the right of every person and where all can pursue their dreams. We express our deep appreciation for the sacrifices of the honorable men and women in uniform who defend liberty. As they work to advance the cause of freedom, our nation keeps these brave individuals and their families in our thoughts, and we pray for their safe return. While Thanksgiving is a time to gather in a spirit of gratitude with family, friends, and neighbors, it is also an opportunity to serve others and to share our blessings with those in need. By answering the universal call to love a neighbor as we want to be loved ourselves, we make our nation a more hopeful and caring place. This Thanksgiving, may we reflect upon the past year with gratefulness and look toward the future with hope. Let us give thanks for all we have been given and ask God to continue to bless our families and our nation. NOW, THEREFORE, I, GEORGE W. BUSH, president of the United States of America, by virtue of the authority vested in me by the Constitution and laws of the United States, do hereby proclaim Thursday, November 22, 2007, as a National Day of Thanksgiving. I encourage all Americans to gather together in their homes and places of worship with family, friends, and loved ones to reinforce the ties that bind us and give thanks for the freedoms and many blessings we enjoy. IN WITNESS WHEREOF, I have hereunto set my hand this fifteenth day of November, in the year of our Lord two thousand seven, and of the Independence of the United States of America the two hundred and thirty-second. This year marks the 60th anniversary of the National Thanksgiving Turkey presentation. Though live Thanksgiving turkeys have been presented intermittently to presidents since the Lincoln administration, the current ceremony dates to 1947, when the first National Thanksgiving Turkey was presented to President Harry Truman. The presentation at times has brushed against broader history. For example, the November 1963 event was one of President Kennedy's last in the Rose Garden. The first President Bush conducted the 1990 ceremony just before leaving for Thanksgiving with the troops in the Persian Gulf region. President Clinton in 1996 returned from an Asian summit and literally went directly to the ceremony. The 2007 National Thanksgiving Turkey and its alternate are from Dubois, Indiana and were raised under the direction of National Turkey Federation Chairman Ted Seger. The 21-week old turkey, will weigh about 45 pounds, when he is driven to Washington. The National Thanksgiving Turkey was raised using normal feeding and other production techniques. The one exception is they were provided increased interaction with people so that they would be prepared for their role at the White House Ceremony. 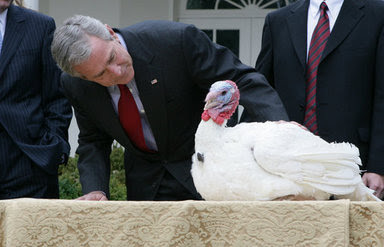 Presidents traditionally have granted the National Thanksgiving Turkey a "pardon". After the presentation, the turkey will be flown first class to Disney World in Orlando, where he will be the grand marshal of “Disney’s Thanksgiving Day Parade.” After the parade, guests will be able to visit the bird in the backyard of Mickey’s Country House in Magic Kingdom Park. "This Thanksgiving, may we reflect upon the past year with gratefulness and look toward the future with hope. Let us give thanks for all we have been given and ask God to continue to bless our families and our Nation." your leadership has kept us safe at a time of war. Hillary's polling numbers in Iowa are falling. In a just-released ABC poll, she has slipped behind Obama who has 30%, Hillary is at 26%, and John Edwards is at 22%. Good Morning America's ROBIN ROBERTS to George Stephanopoulos: "Along with Obama's lead, the ABC News poll shows some troubling results when it comes to honesty with Senator Clinton. Only 50% of those polled say she's willing to say what she really thinks, and when asked who was most trustworthy, Obama beats her two-to-one. So what is it they don't think she's being honest about?" STEPHANOPOULOS:A whole lot of things, Robin. Remember two weeks ago there was this debate where Hillary had some trouble answering those questions on whether or not she would give driver's licenses to illegal immigrants. Ever since then, her opponents, both Barack Obama and John Edwards, have been driving this issue of honesty and trustworthiness on every issue. They say that Senator Clinton is not saying that she thinks about Social Security, is not saying what she thinks about what she would dune in Iran or Iraq and it’s starting to take a toll about Senator Clinton now in Iowa. On Hardball ... Washington Post's CHRIS CILLIZZA: I think everyone's going to see this tomorrow and think, wow, Barack Obama 30, Hillary Clinton 26. Now, pollsters will tell you, well, the statistical margin of error, not all that much has changed: baloney. This race is about perception, and if people perceive Barack Obama as surging, that is very important. Remember, the biggest argument in Hillary Clinton's favor is that she is inevitable, that she's going to win this nomination no matter what. Well, when polling starts to come out that shows Barack Obama ahead of her, that argument really goes to pieces. MAJOR GARRETT: Here are the poll numbers from Iowa. For the very first time, Barack Obama now leads in the state, 30% for Barack Obama, 26% for Hillary Clinton. MATT LAUER: Barack Obama at 30%. Hillary Clinton 26. CAROL COSTELLO: Barack Obama with 30% support and Hillary Clinton with 26%, in the make-or-break state of Iowa. WILLIE GEIST: Barack Obama has a slim lead, 30%, Hillary Clinton at 26. CHRIS CILLIZZA: Wow, Barack Obama 30, Hillary Clinton 26. Once someone in the media, namely Tim Russert, took the time to peel back the layers and ask the tough follow-up questions, Hillary started exposing her weaknesses. As Rush Limbaugh pointed out, her candidacy has been a house of cards. Now is the time for the tough questions from the MSM ... and it's time for answers from Mrs. Clinton. It is time to release the records from the Clinton library that they are playing coy with, it is time to truly examine her record including her health care innitiatives during the Clinton administration -- what was her record of accomplishment during that time? And while they are at it, the media may want to dig a little more into Whitewater and the Rose law firm papers that disappeared and were later found at the White House concerning Madison Guaranty Savings and Loan, and Travelgate when White House travel office employees were fired by the Clintons without reason and Billy Dale was falsely accused and sent to trial (after working at the White House for 30 years and eight presidents). There are many questions in the background of the Clintons ... if the media would follow up and do their jobs as much as they do when going after a Republican candidate. SWAC Daughter was anxious to put the Christmas tree up early this year. As I was growing up, a tradition was for my parents to give us ornaments from places they had traveled each year, and we continued the tradition with our children ... so we have many "special" ornaments. Stacy touched my heart more than any other child I worked with because of his devilish sincerity. I loved that child! He was from southwest Virginia, one of many children from a large, poor Appalachian family. As best I can remember, his siblings were playing cowboys and Indians and tied him to a tree, piled leaves at the base, and set the leaves on fire. Stacy was horribly burned, so much so that both legs and one arm had to be amputated. He came to Children's Hospital for rehabilitation. The children lived in the dorms and received daily treatment as well as schooling so Stacy was with us for a long time as they worked with him to heal his stumps so he could receive prosthetic devices to help him lead a normal life. For someone who had been through such a horrible experience, he had a devilish sense of humor. He was funny, playful, and almost always in a good mood. Perhaps it was the love he received from all of us as he went through physical therapy, recreational therapy (which was where he painted the Christmas ornament), and the one-on-one schooling he received. I still remember the day he presented the decoration to me. I kneeled beside his wheelchair to be on his level as he flamboyantly presented it to me ... then I took it home to my Christmas tree and, after the holidays, packed it away ... and every year for the past 32 years it has been placed on my tree. Stacy would now be a young man in his 40s. I don't know what happened to him ... I lost track after leaving Children's Hospital. I have often wondered where he is, how his life turned out, and if he was able to handle the emotional scar of such a life-changing incident so young in his life. A Virginia Commonwealth University student is on life support after falling nearly three stories from the roof of his home early this morning in the Fan District. At the holidays when these things happen it seems even sadder. I can imagine his familiy rushing to the hospital and sitting by his bedside watching for a flicker of an eyelid or the twitch of a finger, waiting and hoping and praying ... while the rest of us are with family enjoying our Thanksgiving. How sad. My prayers are for this young man and his family. Today is "prep" day in the kitchen ... chopping, slicing, pre-cooking, preparing for Thursday's Thanksgiving dinner. Since my sister is here from Texas and will not be back for Christmas, I am working on some of the candy I make each year ... a pan of dark chocolate-covered pecan toffee and a pan of fudge are cooling on the dining room table. One sister is baking apple pies, the other is making pumpkin, and SWAC Daughter is putting together apple turnovers from a yummy Williamsburg recipe she uses. We have lots more to do and tomorrow will be filled with more preparation so that Thursday we can watch the Macy's Thanksgiving parade, football, play board games, and enjoy being together. Family ... we are blessed. Ross Mackenzie: "We are at war ... the jihadists seek to kill us"
Chris Saxman continues to explore the feasibility of running for the U.S. Senate seat being vacated by a retiring John Warner. Phoning, talking, and meeting with possible supporters, Del. Saxman is laying the groundwork to perhaps challenge former Governor Jim Gilmore who formally announced yesterday that he will run for the Republican nomination. If he decides to throw his hat in the ring, Del. Saxman faces a Gilmore organization that has been in place for months. He would also need to raise a substantial amount of money going into the Republican convention to be held in Richmond at the end of May. While Jim Gilmore would bring extensive experience to the table, he would also face a hostile media that has been more interested in painting him in a negative light instead of highlighting the positives of his career, most notably the successful car tax campaign. He has a military background in intelligence, served as Virginia's lieutenant governor and governor, was Republican National Committee Chairman, and guided the Commonwealth through the 9/11 crisis. Although less experienced, Del. Saxman, who is a Staunton businessman and has spent the past six years in the state House of Delegates, has a record of accomplishment and generally enjoys a favorable interaction with the press. He has served on the Cost Cutting Caucus, has been a champion for five years of school choice, and was a supporter of the 2006 Marriage Amendment that was overwhelming passed by state voters. His candidacy would present a fresh face that Republicans may be looking for after recent defeats. It's deceptively chilly today in the Valley as a pea-soup fog that never lifted continues to block the mountains from view even in mid-afternoon. My sister and I needed to restock our spices for Thanksgiving and Christmas baking so headed out in the fog and mist to the Cheese Shop in Stuarts Draft to stock up on nuts, spices, and grains. A Mennonite business, those folks have products in bulk and it is much more reasonably priced and fresher than those found in most grocery outlets. One of the local home school graduates works there part-time while attending college, and all the folks are very knowledgeable and nice. After leaving the Cheese Shop, rode down to Country Connections which is another stop in Stuarts Draft for visitors to the Valley because they offer a huge variety of outdoor furniture, indoor furnishings, home decor, candles ... everything you can think of to decorate a country-style house. While heading to the Frontier Culture Museum in Staunton, the fog hung low over Betsy Bell and Mary Gray mountains, the twin landmarks that can be seen from miles away and are within the city limits of Staunton. It was misty so not a good day to make the trek around the farms ... another time ... but saw the new house that was recently moved to the museum and is still sitting on the flatbed in the parking lot. I just turned off Rush Limbaugh's radio program! Jim Gilmore: "Why I'm running"
"These are challenging times for our country. We are threatened by terrorism, concerned about a difficult war, stuck in traffic, dissatisfied with how our children are educated; and too often our culture seems more interested in the latest doings of tabloid celebrities than the debates that could decide our country’s future." And thus Jim Gilmore begins the post on his Virginia Patriot blog announcing he is running for the U.S. Senate seat being vacated by John Warner. I’m running for the United State Senate from Virginia because I want to be one of those leaders who call on the spirit that is common in all of us, and use it to restore our country for the benefit of our people and in the eyes of the world. I’m a veteran, having served our country in Army counter-intelligence; and I’m a former law enforcement official. I can offer Virginians unparalleled experience and a strong and steady hand in the United States Senate. I was Governor of Virginia when our nation was struck on September 11th, and I helped Virginia deal with the aftermath of the attack on the Pentagon. It was a time of great challenge. It was also a time when Virginia and America came together to work for the common good. That is the type of leadership we need today to address the vital issues facing the citizens of our Commonwealth, issues like national security, transportation, education and immigration. On all these issues, our leaders have let us down, and we badly need new hands at the wheel. And in the last year, we have unfortunately seen that these failures are not unique to just one political party. It’s time for a change! We can do better, and we have to. Go to his post and read the entire thing. Jim Gilmore officially announces for Senate ... the race is on! ALEXANDRIA -- Former Virginia Republican Governor Jim Gilmore said today he is a candidate for the U.S. Senate, setting up what the media has labeled "Clash of the Titans 2008" as Gilmore takes on former Democrat Governor Mark Warner for the honor of succeeding U.S. Sen. John Warner. "We have a great many challenges facing our country." said Gilmore. "Of course, serious problems and crises are nothing new for America. But today, I'm sorry to say, we also find too often that our leaders just aren't up to the challenge." "America has a lot of work to do and doesn't have the right leaders to do it," the former Virginia Governor said. Although America is facing great challenges Gilmore said he remains optimistic about the future. "We haven't lost what's down deep in all of us, and what really keeps us together despite all the problems that seem to have descended on us of late," said Gilmore. "I'm running for the United State Senate from Virginia because I want to be one of those leaders who call on the spirit that is common in all of us, and use it to restore our country for the benefit of our people and in the eyes of the world." The Gilmore announcement sets up a high profile contest between the two Virginia candidates for the U.S. Senate. Gilmore, a nationally recognized authority on homeland security, has spent years addressing the issues of national security, terrorism and border security. Mark Warner raised taxes as Governor after promising as a candidate that he would not increase taxes. President George W. Bush will deliver Thanksgiving remarks at Berkeley Plantation this afternoon around 12:40. Berkeley, located in Charles City County, is the site of the first Thanksgiving in America in 1619. Miss Mary Virginia Showalter passed away Saturday, just two days shy of her 93rd birthday. She was the last survivor of the three quilting Showalter sisters from Stuarts Draft in Augusta County. For years the Showalter sisters ... Anna, Laura, and Mary ... crafted quilts that fetched the highest price at the Virginia Mennonite Relief Sale ... a total of 223 quilts. Throughout the years Valley folks would watch to see how high the price would go for those intricate, exquisitely-handmade quilts that helped raise money for Mennonite mission work around the world. After Anna and Laura passed away, Mary continued to sew by staying active in her church sewing circle, a group that also provided a quilt each year for the relief sale. Miss Showalter was born November 19, 1914, one of nine children born to Amos Henry and Lillie Harriet Suter Showalter. Her brother, Truman, is the sole survivor of the siblings. Miss Showalter helped others all her life. In her youth she spent a significant number of years in mission work in the Kentucky mountains, and was later employed at Western State Hospital in Staunton. Her legacy is the quilts and, with her death, a chapter closes on the history of the Valley. She will be laid to rest in the cemetery of the church where she was so active for so many years. The annual Virginia Mennonite Relief Sale, begun on the Wenger farm in Stuarts Draft in the 1960s, was formerly held at Expoland in Fishersville but outgrew that location and moved in 1999 to the Rockingham Fairgrounds. Held the first weekend in October, over 1,000 people are involved in crafts, food, and preparation for the event, and over $3 million has been raised. John Maxfield, our resident history scholar, attended yesterday's sold-out performance of "Spirit of Augusta," a musical that told the history of Augusta County. Written by Mack Swift with music by Richard Adams, the play portrayed the story of Governor Spotswood, the Knights of the Golden Horseshoe (remember them from your history lessons? ), and the settling of the Valley. The production took place at Blue Ridge Cmmunity College in Weyers Cave. Staunton Christmas Parade ... "Holiday Sparkle"
Mark your calendars for Monday, November 26, 2007 -- Staunton's annual Christmas parade will begin at 7:00 p.m. The theme of this year's parade is "Holiday Sparkle" ... and sparkle it will in historic downtown Staunton as Christmas lights twinkle in storefronts as the parade passes by on Beverley Street. This is always a popular parade with the streets crowded four-deep as people, young and old alike, line up to watch the float entries of local churches, businesses, and civic groups, and to hear from local high school bands and to wave to friends in the parade. Fun for all! BD Ohio: "VB Dems will NOT win the Nobel Prize for economics"
My husband has been harping on this issue for weeks ... and rightfully so. We under-bought a house so we would not be financially tied to it, and so I could remain at home to raise and home school our children. We shopped around and secured a fixed-rate loan and purposely avoided those "balloon" loans that we had heard horror stories about. We have been meticulous about our budget throughout the years to maintain a good credit rating. Why, then, do others feel they can buy the big house in the expensive neighborhood, over-extend themselves, obtain a balloon loan because the payments are cheaper (until the rates rise, which they inevitably do) ... and then, when those rates do rise, they expect us, the ones with financial discipline, to bail them out in the form of the government? Brian at Bearing Drift Ohio has a great post about that very subject ... VBDems Will NOT Win The Nobel Prize For Economics. That was the question posed this morning by our pastor during our Thanksgiving service ... "Do you know where you are?" He went on to say, "You are in the land of the free, the home of the brave, in the greatest country in the world ... in a Christian church." He added that many do not even realize how good we have it in America ... and, if in doubt, they should travel the rest of the world ... and then come back home to see that we are blessed. We should give thanks for what we have. The church in turn thanked its staff and, in doing so, gave a standing ovation of applause to this pastor of 35 years who was embarrassed at the attention. This man who has led the church for so long motioned for us to sit down and, as we sat to listen, he thanked us the congregation, the people of the church, and said the church members were the ones who do so much to make the church what it is. D.J. McGuire: "Meanwhile some Republicans STILL don't get it"
D.J. McGuire at Right-Wing Liberal gets it and explains it very well in his post, "Meanwhile some Republicans STILL don't get it." He takes on Zachary Moore's article that blames infighting for GOP woes ... and rejects Moore's reasons by presenting the facts. Delegate Bob Marshall will offer a resolution of "No Confidence" in the House Republican Caucus [today], Sunday November 18, where Republican delegates will select the Speaker, the Majority Leader, Whip, and Caucus Chair. Expressing a sense of no confidence in the policies of the current House Republican Leadership as pursued from 2002 to the present, and urging a change in policy. Expressing a sense of no confidence in the policies of the current House of Delegates Republican Leadership as pursued from 2002 to the present, and urging a change in policy. revenue spending measures and revenue raising measures in violation of the Single Object Provision of the Virginia Constitution rather than return the budget to Governor Warner and inform him that tax and spending measures may not be combined in a single bill. Resolved, that because of the above concerns and the distinct likelihood that the new majority Democratic Senate leadership will propose an unjustified growth in the size of government, increased government spending, and the imposition of new taxes and other policies at variance with Republican principles, that the House Republican Caucus has lost confidence in the policies of the present Republican Leadership, and request that a new policy direction be undertaken consistent with traditional Republican principles." "I found the one my heart loves." Jim Riley over at Virginia Virtucon explored the possibility of Delegate Chris Saxman running for the U.S. Senate seat being vacated by John Warner. Saxman (R-Staunton) won election to the 20th House District in 2001 on his conservative principles. I posed the question to political insiders in SWAC. One of the more interesting conversations was with Augusta County Chairman Dr. Kurt Michael who was encouraged by the fact Chris Saxman was thinking of running for U.S. Senate. Some of the points he mentioned were Saxman's involvement in the Virginia Cost Cutting Caucus and Americans For Prosperity, his support of the Marriage Amendment, and his work to bring about legislation for school choice. Chairman Michael said Chris Saxman is a rising star in the Republican Party, has shown mature leadership in the Shenandoah Valley, and is someone who works well with both moderates and conservatives while holding to his beliefs. This is going to be an interesting election cycle. I am sure I will be posting more about these developments. Well, we figured she might do it, even though not one single error was found during the canvassing of the votes during the two days after election day… Janet Oleszek isn’t ready to let go. On Wednesday, she requested a recount. Nonetheless, their only shot is to disqualify 92 absentee ballots that voted for us out of 712 (paper ballots only, early voting was done on machines). So, we will need your volunteer help and your financial help to finance fighting through this process. The process will probably get started the week after Thanksgiving with a Court hearing and we’ll contact you then for volunteer help. We’ll probably need 15 or 20 volunteers each day that the process is going on. If you can donate to fight off this assault on our victory, please do so here. Thank you in advance for your help! Just to prove that Murphy’s Law is alive and well, this is coming at the same time that we’re due to have our sixth baby. Timing is everything. Blessings go to the Cuccinelli family in the impending birth of their child. Measure Title: A bill making emergency supplemental appropriations for the Department of Defense for the fiscal year ending September 30, 2008, and for other purposes. Saturday, November 17, will feature a Christmas open house from 1-5:00 p.m. in historic downtown Staunton. Thirty-six stores will feature holiday treats for visitors while on the street will be strolling entertainment from Mary Baldwin Madrigal Singers and Dickens Carolers from the American Shakespeare Center. 2 pm: Rachel Brown will be signing her new book "Small Camel Follows the Star" at Pufferbellies. 1-4 pm: Ice Carving demonstrations in the Wharf with Don Swedberg from the Stonewall Jackson Hotel & Conference Center. 2-4 pm: Lexington Carriage Company at the Wharf offering rides to benefit the Children's Art Network Adults $5 & Children $3. 5 pm: Refreshments, carols from the Mary Baldwin College Madrigal Singers and a Magical Lighting Ceremony at the Community Bank Courtyard on Central Avenue. 5:30 pm: Mayor Lacy King will announce the winner* of the $500 giveaway. You must be present to win the $500 in Downtown Gift Cards. * $500 Downtown Shopping Spree Giveaway! Visit 5 participating stores. Get 5 stamps on your entry before 5 pm and you could WIN! Refreshments provided by Blue Mountain Coffees & Community Bank, while supplies last. This event is sponsored by Community Bank...Our name really says it all. Paul Harris for U.S. Senate? Countdown to Christmas ... so cute!